They’re simple, they’re American and, come Thanksgiving, everybody saves room for them. The recipes below for apple, pumpkin and pecan pie have been a tradition in my family for many, many years. It would not be Thanksgiving without them. I share these recipes with you and you can make them even if you do not celebrate Thanksgiving in your country. 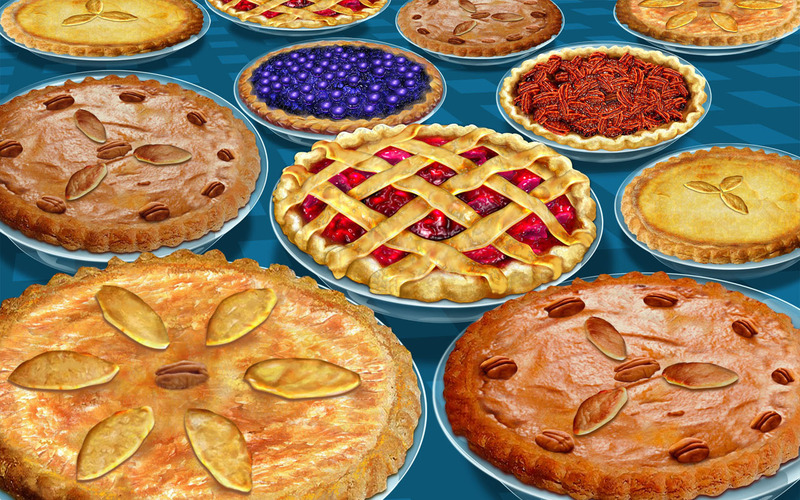 You will need three pie crusts for the Apple and Pecan Pies. You can double the recipe below and freeze the extra crust for another day or make one double and half of a double for the apple and pecan pies. I use a different crust for the Pumpkin Pie because my recipe needs a larger, deeper crust. Whisk together the flour and salt. Add the shortening, working it in until the mixture is crumbly. Cut the butter into small (about ½”) cubes. Add the butter to the flour mixture and work it in with your fingers, a pastry cutter or a mixer. Don’t be too thorough; the mixture should be very uneven, with big chunks of butter in among the smaller ones. Add 4 tablespoons of water and toss to combine. Add enough additional water to make a chunky, fairly cohesive mixture. It should hold together when you gather it up and squeeze it in your hand. Divide the dough in half and form each half into a disk. Smooth the disks and the edges with floured hands. Wrap in plastic and chill for 30 minutes, or even overnight. When you’re ready to make the pie, remove the crust from the refrigerator, leaving it wrapped. Allow it to warm a bit until it’s softened enough to roll, but still feels cold to the touch. Next, measure the bottom diameter and up the sides of your pie pan. For example, if your pan is 7 inches across the bottom and 1 ½ inches up each side, that’s a total of 10 inches. This means you should roll your bottom crust to a diameter between 11 and 12 inches, which gives you enough extra pastry for crimping the edges. Place the crust on a floured work surface and roll it to the desired width. Place the crust in the pan by folding in quarters and placing it in the pan. Unfold the pastry and center it in the pan. Fold the edges of the crust under and gently squeeze them together. Crimp, as desired. 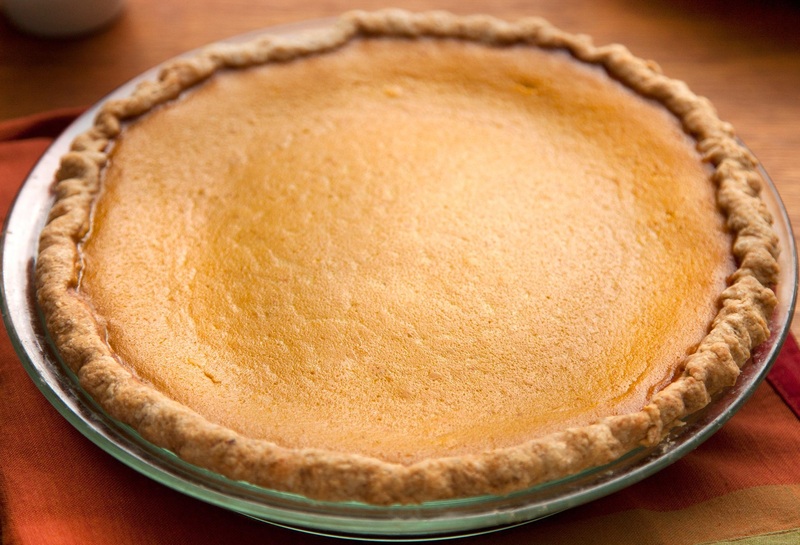 It’s good to make a tall crimped edge for a single-crust pie that is fairly liquid, such as pumpkin or custard. Leave the edges of the bottom crust as is (no crimping). Once you’ve added the pie filling, roll out the top crust to the outside diameter of your pan and place it on top of the filling. Trim the excess crust with a pair of scissors; then press the two edges together. Crimp, as desired. A simple fork crimp is fast and easy. At this point, it helps to return the pie to the refrigerator for 20 to 30 minutes; this chills the fat, which ultimately increases the crust’s flakiness. 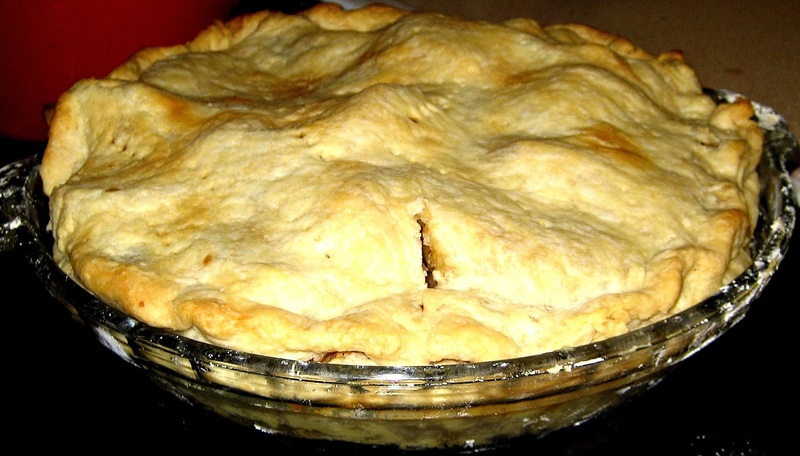 Cut a hole in the center of the crust for steam to escape or slash the pie’s top surface several times. Brush with milk and sprinkle with coarse sugar, if desired. Single Crust, recipe above. Chill in the refrigerator while you make the filling. Roll out half of the dough as directed in the recipe above and invert the dough into a 9 1/2-inch deep-dish pie pan. Pour the filling into the crust, mounding it higher in the center than on the sides of the pan. This recipe makes enough for a single deep dish crust. You will need a 9 inch pie pan that’s at least 1 1/2 inches deep. Whisk together the flour, salt, sugar and baking powder. This can be done right in the pie pan, if you like. Whisk together the oil and water in a measuring cup; then pour over the dry ingredients. Stir with a fork until the dough is evenly moistened. Pat the dough across the bottom of the pie pan and up the sides. A flat-bottomed measuring cup can help you make the bottom even. Press the dough up the sides of the pan with your fingers and flute the top. Chill in the refrigerator while you make the filling. In a large mixing bowl, whisk together the sugars, flour, salt and spices. 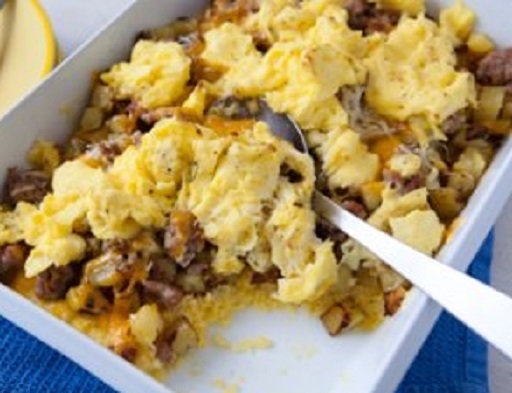 In a large measuring cup, beat together the eggs, pumpkin and half & half. Whisk into the dry ingredients. For best flavor, cover and refrigerate the filling overnight before baking. When the oven is hot, place the pie pan with the chilled crust on a baking sheet to catch any drips. 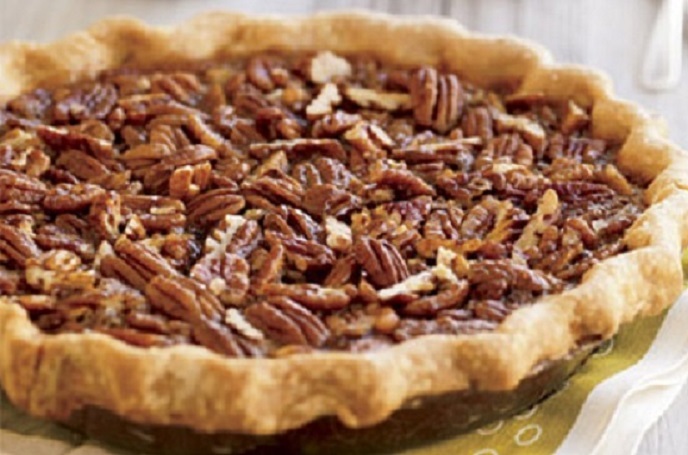 Pour the filling into the unbaked pie shell and place the baking sheet in the oven on the center rack. Bake for 45 to 50 minutes, or until the filling is set 2 inches in from the edge. The center should still be wobbly. Remove the pie from the oven and cool on a rack; the center will finish cooking through as the pie sits. This recipe makes enough filling to generously fill a 9 inch pan that’s at least 1 1/2 inches deep. If your pan isn’t quite that big, you can bake any leftover filling in custard cups; they will take 25 to 30 minutes to cook. Pumpkin pie filling is basically a custard; the eggs in the filling will continue cooking as the heat from the edge of the pie moves toward the center, which is why it’s important to remove the pie from the oven before the center is completely set. Leaving it in the oven too long will cause the eggs to overcook, tightening the proteins and causing the pie to crack in the center. Mixing the filling a day in advance (refrigerate until using) will improve the flavor of this pie by giving the spices’ flavors a chance to blend. 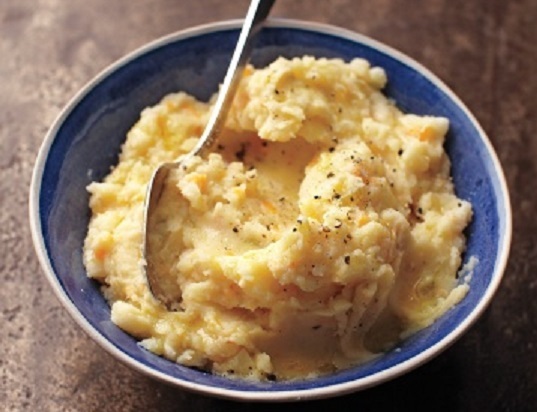 Need Some New Thanksgiving Side Dishes? The centerpiece of contemporary Thanksgiving in the United States and Canada is a huge meal, generally featuring a large roasted turkey. The majority of the dishes in a traditional Thanksgiving dinner are made from foods native to the New World. However, many of the classic traditions attributed to the first Thanksgiving are actually myths. According to what is known about “The First Thanksgiving,” the 1621 feast between the Pilgrims and the Wampanoag at Plymouth Colony contained waterfowl, venison, fish, lobster, clams, berries, fruit, pumpkin and squash. William Bradford (Plymouth Colony Governor) noted that, “besides waterfowl, there was a great store of wild turkeys, of which they took many.” There were definitely wild turkeys in the Plymouth area, however, the best existing account of the Pilgrims’ harvest feast comes from colonist, Edward Winslow, author of Mourt’s Relation: A Journal of the Pilgrims at Plymouth. Winslow’s first-hand account included no explicit mention of turkey. He does, however, mention the Pilgrims gathering “wild fowl” for the meal, although that could just as likely have meant ducks or geese. Many of the foods that were included in the first feast (except for the seafood) have since gone on to become staples of the modern Thanksgiving dinner. The White House Cookbook, 1887, by Mrs. F.L. 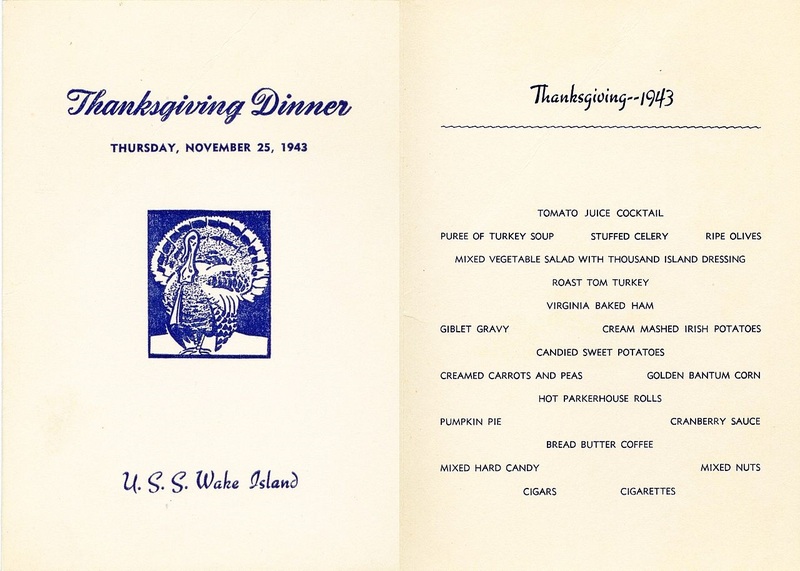 Gillette, et al., had the following menu: oysters on the half shell, cream of chicken soup, fried smelts, sauce tartare, roast turkey, cranberry sauce, mashed potatoes, baked squash, boiled onions, parsnip fritters, olives, chicken salad, venison pastry, pumpkin pie, mince-pie, Charlotte russe, almond ice cream, lemon jelly, hickory nut cake, cheese, fruit and coffee. Many other foods are typically served alongside the main dish—so many that, because of the amount of food, the Thanksgiving meal is sometimes served midday or early afternoon to make time for all the courses. Copious leftovers are also common. Many diners would say the meal is “incomplete” without cranberry sauce, stuffing or dressing and gravy. Other commonly served dishes include winter squash, sweet potatoes, mashed potatoes, dumplings, noodles, corn on the cob or hominy grits, deviled eggs, green beans or green bean casserole, sauerkraut (among those in the Mid-Atlantic; especially Baltimore), peas and carrots, bread or rolls, cornbread (in the south and parts of New England) or biscuits, rutabagas, turnips and salad. 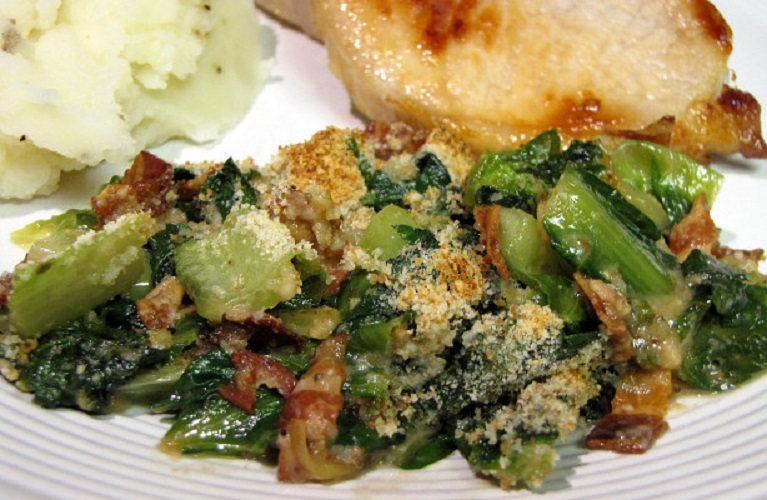 There are also regional differences, as to the type of stuffing or dressing traditionally served with the turkey. 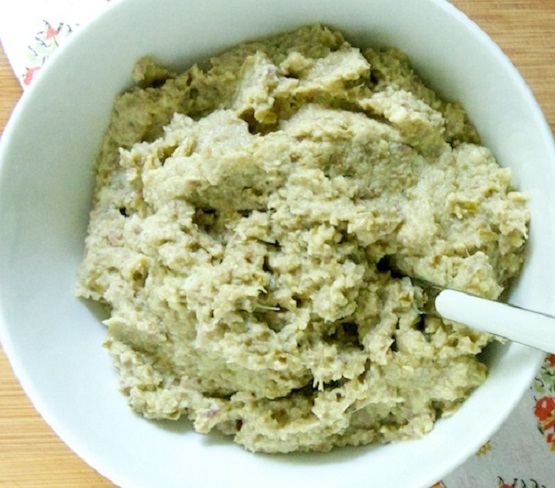 Southerners generally make their dressing from cornbread, while those in other parts of the country make stuffing from white, wheat or rye bread as the base. One or several of the following may be added to the dressing/stuffing: oysters, apples, chestnuts, raisins, celery and/or other vegetables, sausages or the turkey’s giblets. The traditional Canadian version has bread cubes, sage, onion and celery. Rice is also sometimes used instead of bread in some parts of Canada. Other dishes reflect the regional or cultural background of those who have come together for the meal. For example, many African-Americans and Southerners serve baked macaroni and cheese and collard greens, along with chitterlings and sweet potato pie; while Italian-Americans often have lasagna on the table alongside the turkey and Ashkenazi Jews may serve noodle kugel, a sweet dessert pudding. Other Jewish families may consume foods commonly associated with Hanukkah, such as latkes or a sufganiyot (a type of jelly doughnut). It is not unheard of for Mexican Americans to serve their turkey with mole and roasted corn. In Puerto Rico, the Thanksgiving meal is completed with arroz con gandules (rice with pigeon peas) or arroz con maiz (rice with corn), pasteles (root tamales) stuffed with turkey, pumpkin-coconut crème caramel, corn bread with longaniza, potato salad, roasted white sweet potatoes and Spanish sparkling hard cider. Turkey in Puerto Rico is stuffed with mofongo (a fried plantain-based dish). Cuban-Americans traditionally serve the turkey alongside a small roasted pork and include white rice and black beans or kidney beans. 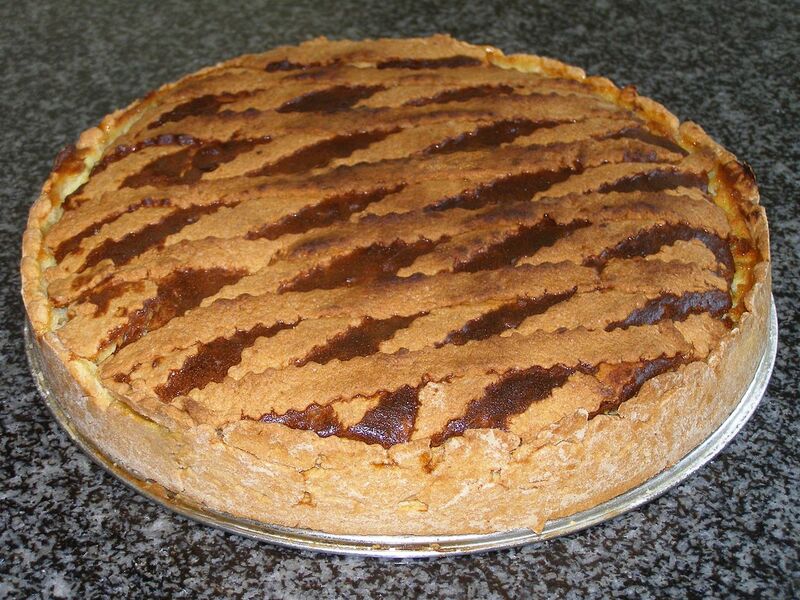 Vegetarians or vegans have been known to serve alternative entrées, such as a large vegetable pie or a stuffed and baked pumpkin or tofu substitutes. Many Midwesterners (such as Minnesotans) of Norwegian or Scandinavian descent serve lefse (a soft, Norwegian flatbread) at their holiday meal. So, if you are not a traditionalist, you may want to change things around a little and try some new sides for your holiday meal. Much of the preparation in the recipes below can be done ahead of time. In a medium saucepan, heat 1 tablespoon oil over medium heat. Add the shallot and cook, stirring, until tender, about 5 minutes. Add farro, stirring until toasted, about 1 minute. Add wine and reduce by half. Add stock, bring to a boil, then reduce heat and simmer, stirring occasionally, until the farro is tender and creamy, 35 to 40 minutes. Season with salt and cover to keep warm. 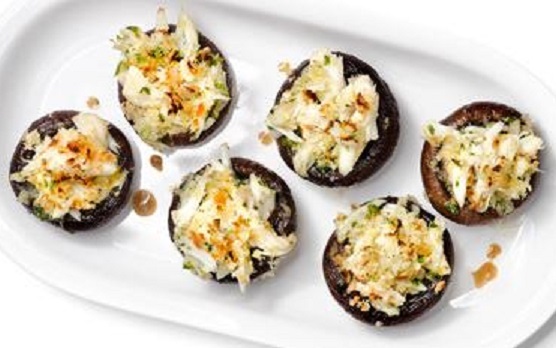 Meanwhile, heat the oven to 450 degrees F. On a rimmed baking sheet, toss mushrooms with the remaining 2 tablespoons of oil and season with salt and red-pepper flakes. Roast, stirring once, until crisp and golden, about 20 minutes. Re-warm the farro over medium heat and add the spinach, stirring until wilted, about 1 minute. Stir in mushrooms and Parmesan. Serve with additional Parmesan. Heat oil in a medium saucepan over medium heat. Cook onion, celery and carrot until translucent, 6 to 8 minutes. Add potatoes and white beans and cover with water by 2 inches. Season generously with salt. Bring to a boil, then reduce heat and simmer until all the vegetables are tender, about 10 minutes. Drain, reserving about 1 cup of the cooking water. Mash vegetables (or put through a ricer), adding reserved cooking water to adjust consistency. Season with salt and pepper and drizzle with oil before serving. 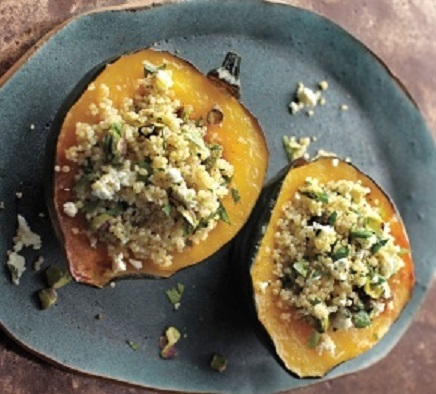 Heat the oven to 425 degrees F. Brush squash with 2 tablespoons of the oil and season with salt and pepper. Roast cut side down on two baking sheets until tender and caramelized, 15 to 20 minutes. Meanwhile, bring quinoa and 2 cups water to a boil in a small pot. Reduce heat and simmer, covered, until tender and water is absorbed, about 15 minutes. Let cool, then fluff with a fork. In a large bowl, combine quinoa, parsley, feta, pistachios, remaining 2 tablespoons oil and vinegar. Season with salt and red-pepper flakes. Fill the squash cavities and serve. Preheat the oven to 350 degrees F. Butter a 2-quart baking dish and dust with cornmeal. Cook sweet potatoes until tender, about 15 minutes. Remove from the heat and mash until very smooth; let cool slightly. Meanwhile, in a medium saucepan, bring milk to a simmer. Whisk in cornmeal in a thin stream. Cook, whisking constantly, until just thickened, 1 to 3 minutes; remove from the heat and let cool slightly. In a large bowl, stir together mashed sweet potatoes, cornmeal mixture, egg yolks, sugar, molasses, ginger and salt. Beat the egg whites with an electric mixer until stiff peaks form. Fold half of the egg whites into the cornmeal mixture. Very gently fold in the remaining egg whites. Spoon mixture into the prepared baking dish, place on a baking sheet and bake until puffed and set, about 35 to 40 minutes. Cut an “X” in the core of each brussels sprout. Place in a shallow baking pan coated with cooking spray. 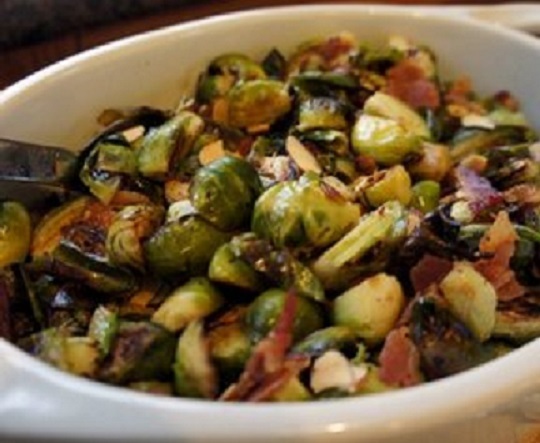 Drizzle oil and lemon juice over the brussels sprouts; sprinkle with salt, garlic powder and pepper. Bake, uncovered, at 400°F for 20-25 minutes or until tender, stirring once. Sprinkle with cheese and crumbled bacon. 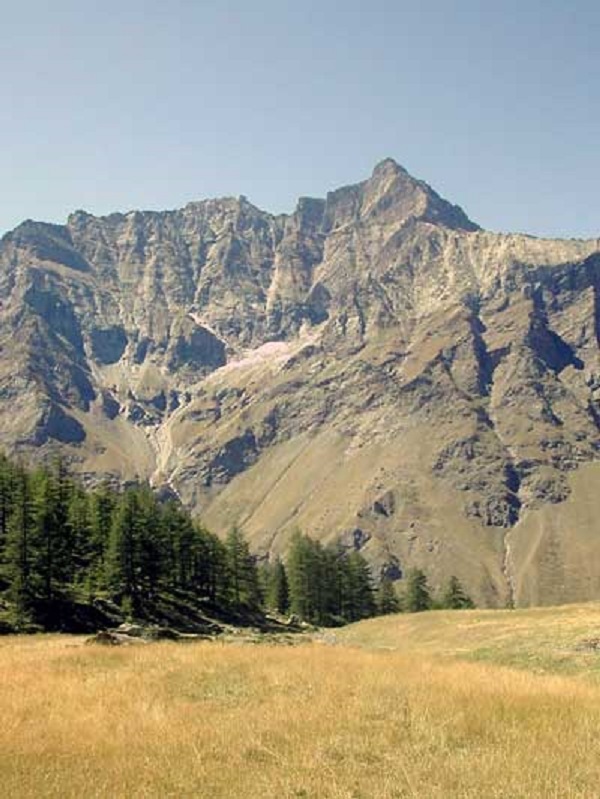 Valle d’Aosta is the most mountainous region of Italy, entirely surrounded by the peaks of the Alps: Monte Bianco, Matterhorn, Monte Rosa and Gran Paradiso. The latter is at the center of a magnificent National Park. Numerous glaciers feed a rich web of streams and the distinctly Alpine character of this region can be seen in the pine forests, up to rather high altitudes, where they give way to large pasture lands. Numerous small Alpine lakes sit in between the majestic mountain landscapes. Aosta is the capital of the region, where a special statute is in place that recognizes the Italian and the French languages as official languages. Important traces of the Roman Age can be found on the Aosta city walls, theaters, Augustus’s Arch and the Praetorian Gate. Visitors can admire the Romanesque Cathedral, which dates back to the eleventh century. The Sant’Orso Church is a good example of medieval architecture. There are many fortified castles in the Aosta Valley; most of them are in perfect condition and open to visitors; many have become historical museums. The most famous are the castles of Fénis, Aymavilles, Issogne and Verrés. 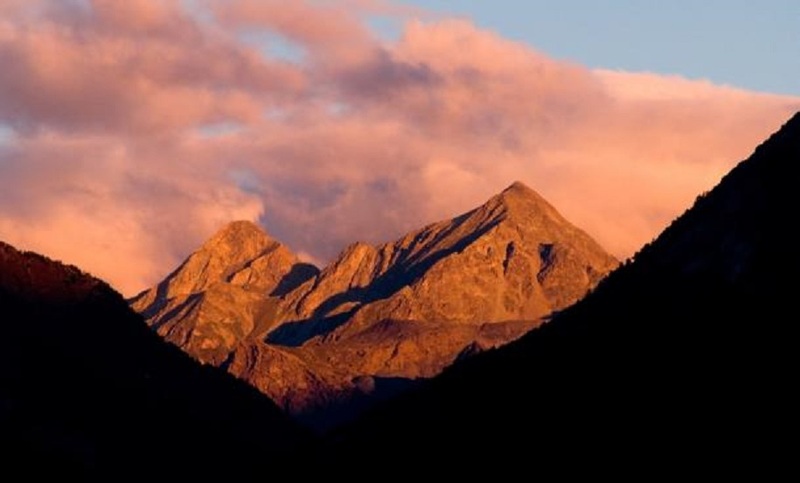 Sunrise over Mount Mucrone, seen from Val di Gressoney, in the Aosta Valley’s section of the Italian Alps. 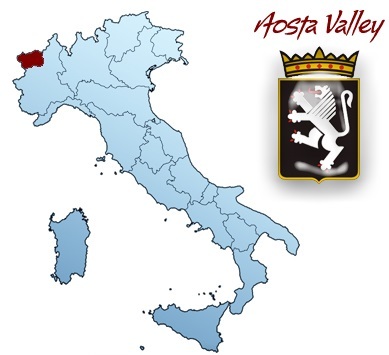 Valle d’Aosta’s unique location and long history of invasion from neighboring lands have combined to make for an interesting and diverse mix of languages and cooking influences that include pockets of Italian, French and German. This diversity makes the numerous local festivals a must-see for any traveler interested in distinctive food and entertainment. The best-loved dishes in the area cover as much cultural ground as the languages. Unlike much of Italy, pasta is not a staple food here. 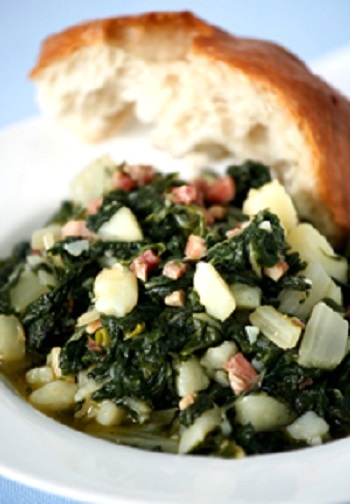 Valle dAosta cooking is based on warming soups, bread, rice, potatoes and gnocchi. Polentas hold a place right alongside Swiss-like fondues and creamy butter sauces. Dairy products are important in the region. Overall, food is relatively simple but hearty: stews thickened with bread, game meats or beef braised with chestnuts in wine sauces, smoked pork and sausages, fresh rye breads with local dark and slightly bitter honey, rich and nutty fontina cheeses, strong grappa and creamy panna cottas. Herds of free range pigs are used for the famous prosciutto known as Jambon de Bosses and for making salt pork. Boudins, spicy sausages made from pork blood, and salami are preserved in rendered pork fat. Mountain streams provide trout and recipes include stuffing the trout fillets with ham and fontina and poaching them in white wine. The valleys offer a wealth of crops like cabbage, grapes, apples and garlic and, while vintages are small, the wines produced in the area are of excellent quality. 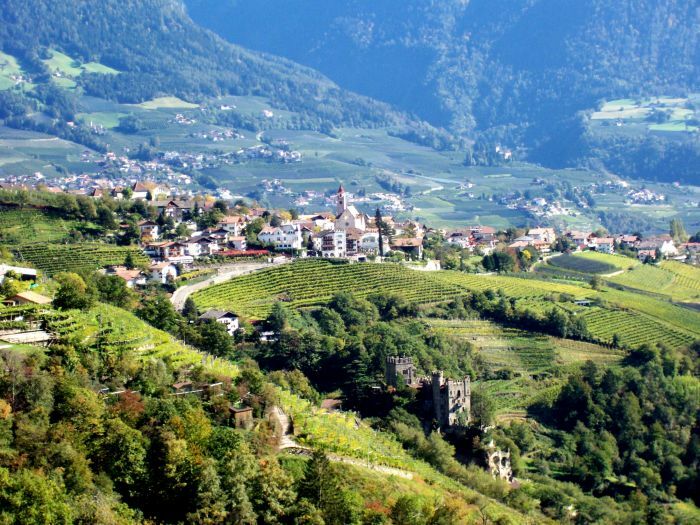 The area is most famous for fontina cheese and it is used in everything from appetizers to desserts. Fruit from the Alps is very sweet and many desserts are prepared with the locally grown apples and pears. These fruits are often cooked with red wine. Sweets include tegole, a cookie named after the roof tiles that they resemble. Torcetti, or ring-shaped cookies, are also flavored with honey before being dusted with powdered sugar. Take a tour of the area with the video below. 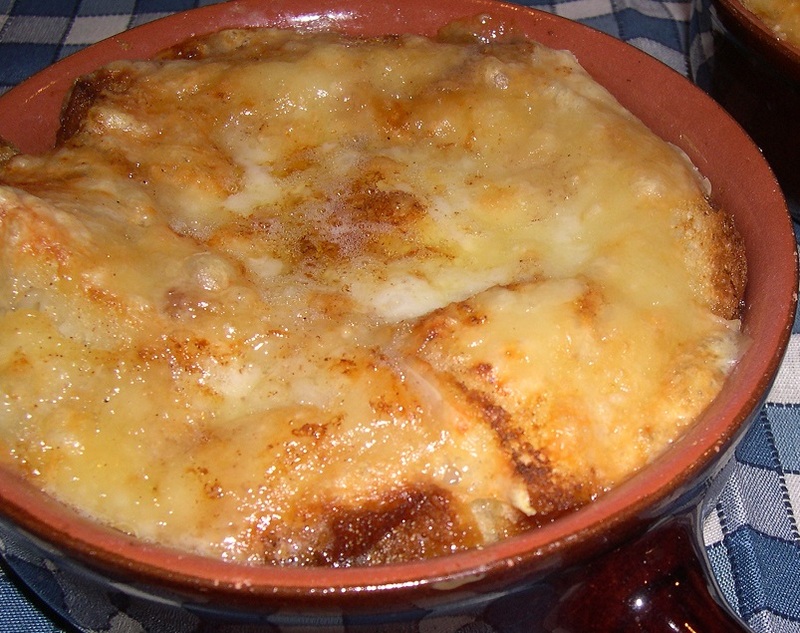 One of the favorite and most representative dishes of the Valle d’Aosta is zuppa di valpelline, a thick fall soup made from fresh cabbage, rye bread and fontina cheese. Layer an oven dish with the bread slices and, then, the fontina cheese. Boil the savoy cabbage in the meat stock. Pour the mixture over the bread and wait until it all softens, then pour the melted butter over the top. Sprinkle on some cinnamon and place in a pre-heated 425 degree F (220°C) oven and cook for about 40 minutes, until a golden crust forms on top. Serve hot. Cut the Fontina cheese into thin slices and insert into the meat and then tap gently with a meat pounder. Saute in butter until the chops become golden and crunchy. They are traditionally served with sautéed cabbage. Cook the potatoes in lightly salted water (without peeling). It is best to start with cold water. The potatoes should all be about the same size. Cooking time depends on the type and size. A rule of thumb for testing if the potatoes are cooked is to stick a fork into one or two potatoes and, if it goes easily, the potatoes are done. When ready, drain, peel and mash them through a potato ricer, (do not use a food mill, as it would make the puree sticky and thus impossible to work with) and place the riced potatoes on a floured pastry board or marble surface. Should the potatoes be too watery, put them back on the stove over moderate heat and let them dry well, stirring constantly. Add a small amount of salt and as much white flour as necessary to make the dough soft enough not to stick to your fingers. You don’t have to knead the dough for too long, just long enough to bind all the ingredients. Cut a piece of the dough off, coating your hands with flour and roll the dough into a long cylinder about the thickness of your index finger. Then cut the cylinder into pieces about l-inch long. Press the dough lengthwise toward you and against the board with your fingertips. This will make each piece curl up, taking the shape of a little shell. You may also use other utensils, such as the back of a cheese grater or a fork and, In this case, gnocchi will be ridged and curled. It is not necessary to give them a particular shape, though. They may be simply cut into nuggets of any desired size. 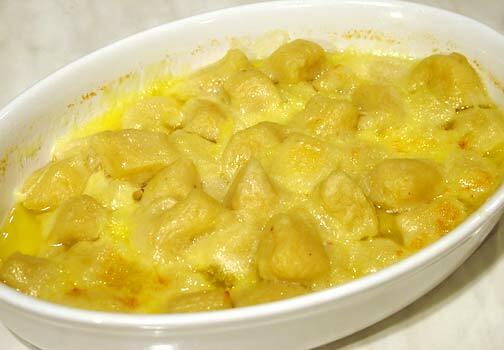 Cook gnocchi in boiling salted water. They are cooked when they rise to the top of the water. Drain. 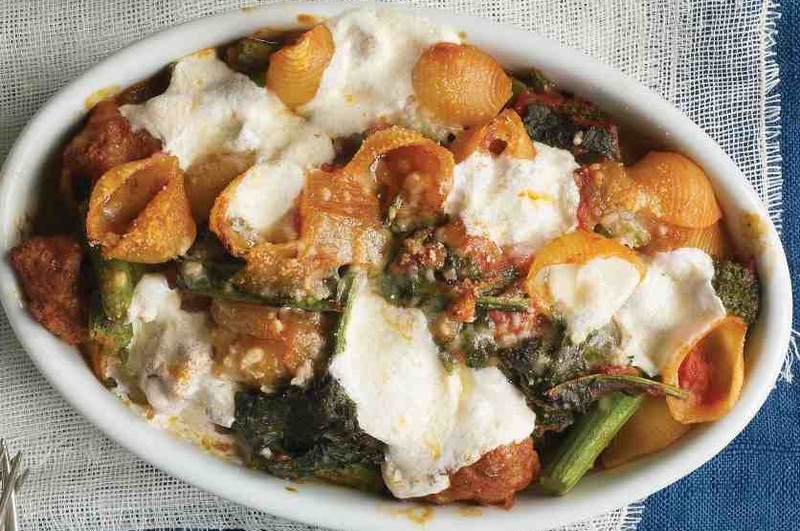 Place alternate layers of gnocchi and Fontina in a buttered baking dish, making sure you have at least 3 layers. The top layer should be of cheese. Dot with butter and bake for 5 minutes. Let the gnocchi rest 5 more minutes and serve. 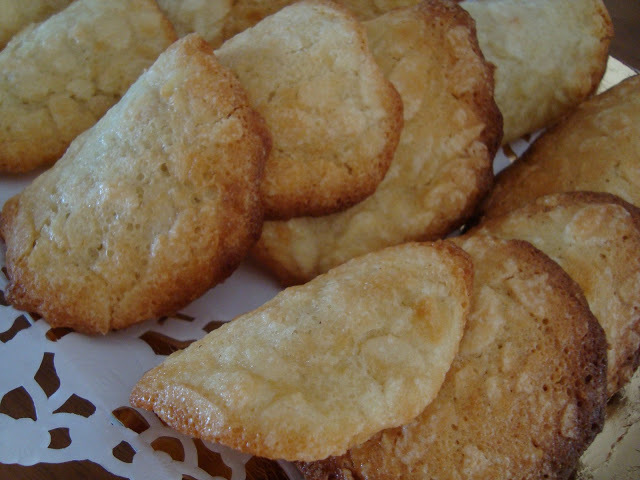 These are delicious cookies that are part of the traditional cuisine of Valle d’Aosta. Their name is due to its shape, which is reminiscent of the typical curved roof tiles. To achieve this effect the hot cookies are pressed over a rolling-pin. The tiles are enjoyed with a cup of coffee at breakfast or as a snack. 4 large egg whites, at room temperature. Toast the almonds and hazelnuts on a baking tray lined with baking paper. Bake in preheated oven at 150 degrees F for 30 minutes. Let them cool thoroughly and then transfer them in a blender or processor along with half of the granulated sugar. Process until thoroughly ground. Transfer the ground nut mixture in a large bowl and add the flour, melted butter and vanilla. Stir with a spatula until the butter is incorporated and set the bowl aside. Place the egg whites in the electric mixer bowl and, with the whip attachment, beat the egg whites until they begin to thicken. Sprinkle on the remaining sugar and beat until stiff. Fold the egg whites into the flour mixture with the spatula. Cover a baking pan with baking paper and place a small amount of dough (about a scant tablespoon) on the baking pan about 2 inches (3-4 cm) apart. Spread the dough with the back of a spoon to form circles with a diameter of about 7 cm (2 ¾ inches). Wet the back of a spoon to simplify the process. Bake the tray in a preheated oven set at 350 degrees F (180 C) for 8 minutes. When they are crisp and lightly browned, remove each cookie from the baking pan and lay them over a rolling-pin to acquire their characteristic curved shape. Repeat the process with the remaining cookie dough. Grains are made up of three parts: the bran, germ and endosperm. The bran is the high-fiber outer coating. The germ is the protein and nutrient dense portion. The endosperm is a source of carbohydrate, along with some protein. A grain is “whole” if these three parts have been left intact. If it’s processed (e.g., cracked, rolled), it’s still considered a whole grain, if it retains its original balance of nutrients. When grains are refined, the bran and germ are removed (taking many nutrients with them), leaving just the endosperm. An example of a refined whole grain is white rice (though usually white rice is enriched to replace some of the nutrients stripped during processing). The terms “hard” and “soft” refer to the protein and gluten content of wheat. Hard wheat is made into pasta and bread flour, while soft wheat (lower in protein and gluten) is milled into pastry flour. 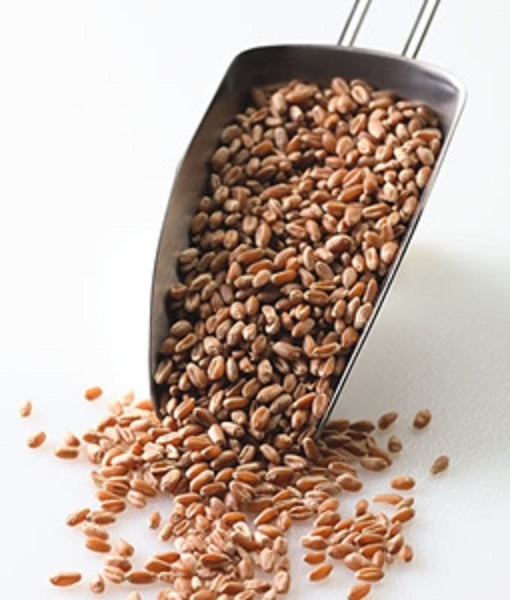 Wheat berries can be cooked whole for a variety of sweet and savory dishes. Once cooked (simmered in boiling water for up to an hour), they are a great addition to soups, stews, salads and desserts. 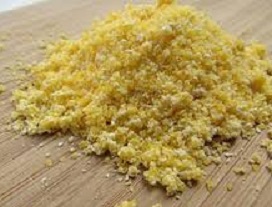 Polenta is made from ground corn, as is cornmeal. They differ in how they’re ground (in both the method and the fineness of the grind). Polenta makes a delicious base for sauces (ragu, mushroom, gorgonzola) and sausages; it’s also good grilled or layered in casserole dishes. Short Grain Brown Rice has fat kernels that are plump and round. 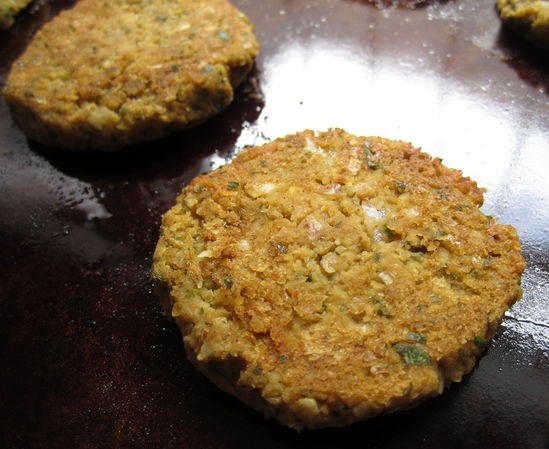 They have a high starch content, which helps keep it moist and sticky. Short grain rice can be used for risotto if soaked overnight or parboiled before making the risotto. 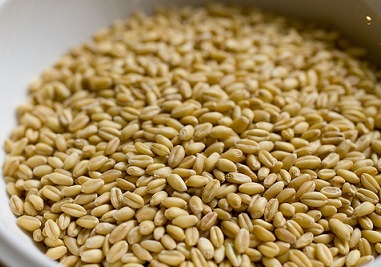 Farro is the Italian name for emmer wheat, an ancient strain of hard wheat from the Fertile Crescent in western Asia. Often confused with spelt due to their similar taste and texture, farro comes in perlato (pearled) and semi-perlato (semi-pearled); opt for semi-perlato as it has more of the fiber-and nutrient-rich bran intact (or buy whole farro if you can find it). It comes in three grades: long, medium or cracked. If you purchase long or medium farro, you will need to crack it yourself in a coffee grinder or blender for maximum freshness. Farro is beloved in Italy – and more recently in North America and other European countries as well – for its roasted, nutty flavor and distinctive chewy texture. Because farro contains a starch similar to that found in Arborio rice, it behaves much like risotto, releasing a creamy, binding liquid when cooked. 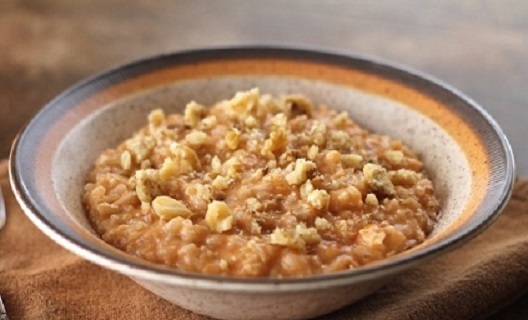 But unlike risotto, farro doesn’t become gummy; instead, it retains its tender, distinct bite, even if it sits awhile after cooking. Farro’s tough husk makes it more difficult to process than other commercially produced grains, but that husk also helps protect the grain’s vital nutrients. 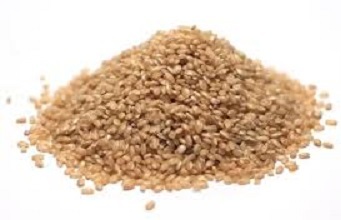 With a higher fiber and protein content than common wheat, farro is also rich in magnesium and B vitamins. As a type of wheat, farro is unsuitable for those with celiac disease, gluten intolerance or a wheat sensitivity or allergy. Note: as with all grains, pearled farro will take less time to cook than semi-pearled, which will take less time to cook than whole. 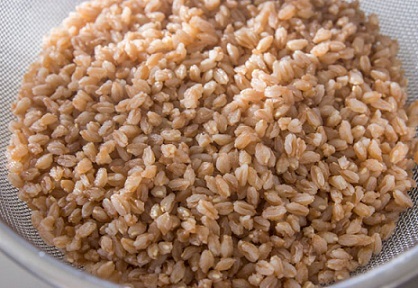 How to cook farro: Combine with water in a pot and bring to a boil. Reduce heat to low, cover and simmer for up to 40 minutes, or until grains are tender and have absorbed all of the liquid. Rinse farro. In a medium saucepan bring 2 cups water to boiling. Stir in the farro. Return to boiling; reduce heat. Simmer, covered, for 20 to 25 minutes or until farro is tender. Drain. In a large skillet bring the 3 cups of chicken broth to boiling. Add the chicken breasts, salt and pepper. Reduce heat. Simmer, covered, for 12 to 15 minutes or until no longer pink (165 degrees F). Using a slotted spoon, transfer chicken to a cutting board. Cool slightly. Coarsely chop or shred chicken. Set aside. Reserve broth. In a 4-quart Dutch oven heat the olive oil and add the onions, zucchini, celery and carrots. Cook for 5 minutes or until tender. Stir in oregano and crushed red pepper. Stir in reserved broth, tomatoes and tomato paste. Bring to boiling; reduce heat. Simmer, covered, for 20 minutes. 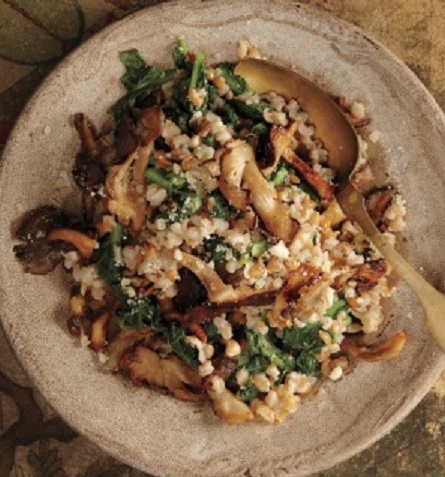 Stir in cooked farro and chopped or shredded chicken. Cook and stir until heated through. Top with grated cheese. Heat 1 tablespoon of olive oil in a medium skillet and sauté the onions over medium-low heat until golden brown. While the onions are cooking, steam the potatoes in a small amount of water in a covered pot until they are tender. Add the steamed potatoes to the onions, season with salt and pepper and cook the potato/onion mixture until the potatoes are browned. Set aside in a covered bowl. Cook the sausage, breaking it up as it cooks, until it is no longer pink. Drain and cool. Refrigerate the onion-potato mixture and the sausage separately overnight. Bring 3 cups of water to a boil. Whisk in the polenta, Italian seasoning and a ½ teaspoon of salt. Cook the mixture over low heat, stirring occasionally, until thick and smooth (approximately 7 minutes). 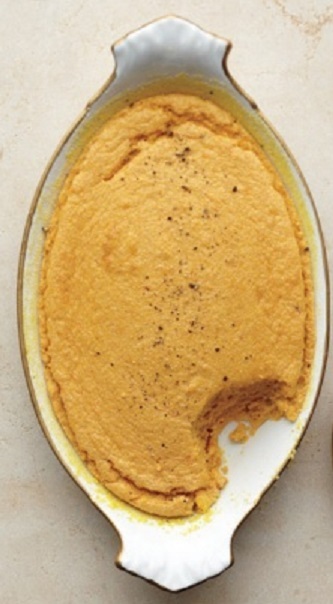 Pour the polenta into an ungreased 9×13-inch baking dish. It will firm up as you scramble the eggs. Spread the potato mixture, sausage, Parmesan and cheddar over the polenta. Pour the eggs on top of the entire dish. Bake until heated through and the cheese is melted and bubbly, about 15-20 minutes. Cool slightly and serve. In a medium saucepan combine broth, farro and water. Bring to boiling. Reduce heat, cover, and simmer about 30 minutes or until farro is tender. Drain farro, reserving 1/2 cup of the cooking liquid; set both the farro and cooking liquid aside. In a large skillet heat the oil over medium heat. Stir in the Italian seasoning. Add corn and green onions. Cook for 2 minutes, stirring occasionally. Add zucchini and cook for 2 minutes more. Stir in reserved farro, salt and black pepper; cool slightly. Stir in 1/2 of the cheese and 1/2 of the basil. Cut peppers in half lengthwise. Remove and discard seeds and membranes from the peppers. Fill pepper halves with the farro mixture. 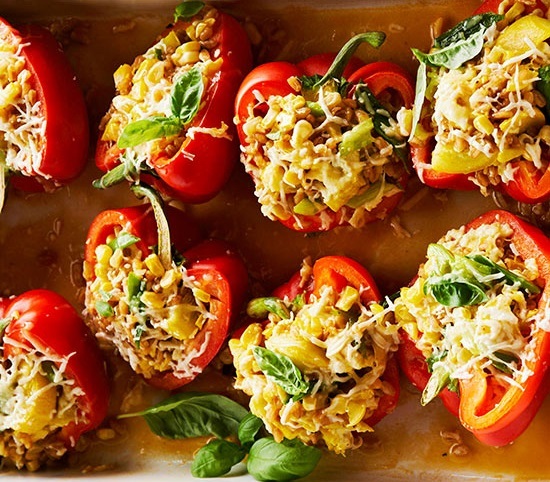 Place stuffed peppers in a 3-quart rectangular baking dish. Pour the reserved cooking liquid into the dish around the peppers. Cover dish with foil. Bake for 30 minutes. Remove foil. Sprinkle with remaining cheese. Bake, uncovered, about 15 minutes more or untilthe peppers are crisp-tender and cheese is melted. Sprinkle with remaining basil. Add your favorite ingredients, if you wish. Put oil in a large, deep skillet over medium heat. When it’s hot, add the onion or shallot and cook, stirring occasionally, until it softens, 3 to 5 minutes. Add rice and cook, stirring occasionally, until it is glossy and coated with oil, about 5 minutes. Sprinkle with salt and pepper; add the wine. Stir and let liquid come to a boil. Reduce heat slightly. Begin to add the stock, about ½ cup at a time, stirring after each addition and every minute or so. When the stock is just about evaporated, add more. Keep the heat medium to medium-high and stir frequently. When rice is just about tender and mixture is creamy, add the Parmesan, then taste and add more salt or pepper (or both) if necessary. 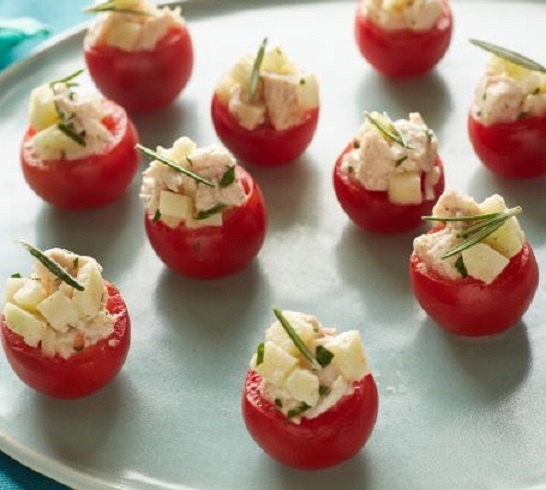 Garnish with basil or parsley and serve. Put the flour, sugar and salt in a food processor bowl fitted with the metal blade. Pulse to mix the dry ingredients. Cut the butter into 1/2 inch cubes and drop them in through the feed tube along with the lemon zest and pulse the machine in short bursts, about 10 times. The mixture should be crumbly. Put in the eggs and pulse a few times to mix the eggs into the dry ingredients. Sprinkle 3 tablespoons of water on top of the dough. Pulse 6 times for just a second or two. The dough should resemble cottage cheese. Pick up some dough and press it together. If it doesn’t hold together, add another teaspoon of water until the dough holds together. Scrape the dough onto a floured board and knead to form a smooth, tight dough. Press into a flat disc and wrap the dough in plastic. Refrigerate for a few hours before using. Put the ricotta, eggs, sugar and orange flower water in a large bowl and mix the ingredients well. Mix in the candied fruit and wheat berries. Cut off about 1/3 of dough and set aside. With a rolling-pin, roll out the remaining pastry dough to about 15 inches in diameter. It should be about 1/8 inch thick. Flour the board and top of the dough to avoid the dough sticking to either the board or the rolling-pin. Place the dough in the pan to fully cover the bottom and sides. Cut off any excess dough from the pan rim. If the dough breaks just patch it. Pour in the ricotta mixture. Tap the pan on the board to ensure the filling is well settled. Roll out the reserved dough into a 9×12 inch rectangle (the pastry should be about an 1/8 inch thick) and cut 1/2 inch lattice strips on a diagonal. Bake in a 350 degree oven for about 45 minutes or until the ricotta filling is well set and a skewer place in the center comes out dry. Rotate the pastiera once to ensure even baking. Dust the top with confectioners sugar. Serve at room temperature. For decades, Italian country cooks have simmered greens and buttery white beans together. When we eat greens—such as escarole, Tuscan cabbage, spinach and chard—we are eating the leaves of a plant. Leafy greens are miracle vegetables—not only are they are low in calories, rich in amino acids, vitamins A and C, minerals and fiber, they also help with digestion and boost the metabolism. In addition, they are believed to provide a host of health benefits—from building up the immune system to balancing hormones. For salads, baby spinach is preferable because the leaves are more tender, but mature spinach is used in Italian cuisine in a myriad of ways—from the classic sautéed spinach to the fillings for a variety of pasta ripiena (filled pastas). Also, many pasta dishes, rolled meat preparations and crespelle (filled crêpes) use spinach as a main ingredient. Trim off the reddish roots from each bundle and eliminate any yellowish leaves Then wash the leaves three times in a clean sink filled with water. 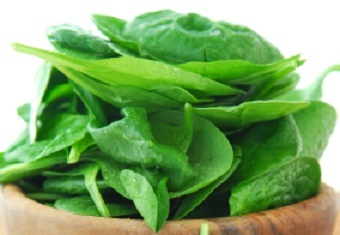 Fresh spinach often comes with a good deal of sand and dirt—so you want to be sure to thoroughly wash the spinach before cooking. Let the leaves dry out a bit in a big colander. In a large sauce pan, heat extra virgin olive oil on a low-medium flame; add one clove of peeled garlic (flattened with a knife) and then add the spinach, a little salt (very important because this will help release the spinach juices) and cover with a lid for a couple of minutes, until the leaves cook (they will shrink substantially). Then, remove the lid and allow the excess liquid to evaporate. Grate some nutmeg over the cooked spinach and serve. Note: This basic method can be used with any greens and other vegetables with a high water content. None of the leafy greens’ nutritious juices are wasted when you cook and steam them in this way—it’s one of the quickest and healthiest ways to prepare them. This vegetable is used a great deal in Italian cuisine in all its forms—as verdure cotto (cooked vegetables) or biete saltate in padella (sautéed in a pan). Because the stems take longer to cook than the leaves, it’s best to cut out the stems and cut them in half-inch pieces. Boil these pieces first in a small amount of salted water and then two minutes later add the leaves, cut in slices. After cooking another two minutes or less, drain and sauté the chard right away on a high flame in olive oil with a crushed clove of garlic. After just a couple of stirs, they’re ready to serve as a delicious contorno (side dish). 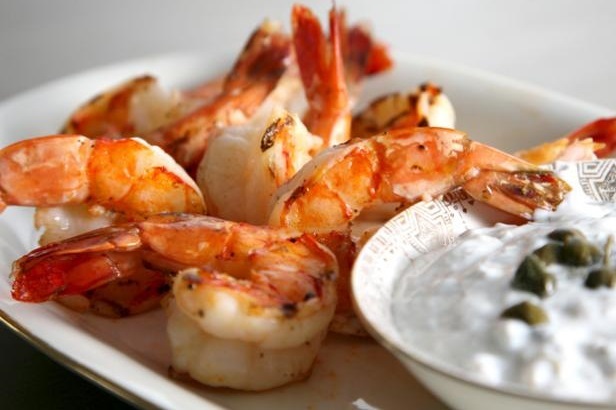 Just drizzle with some good extra virgin olive oil on top before serving. For other more complex preparations, the following method for cooking chard can be used: Drain the chard from the boiling water with a strainer and immerse them right away in ice and water. Then press the leaves firmly to remove the water or spin in a salad spinner to remove the water. Next, sauté the chard in a pan as described above. 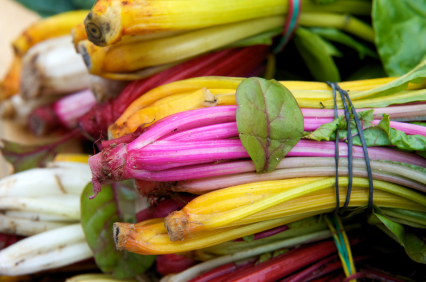 Cooked chard can be used in pasta dishes or as a filling for a focaccia, in frittatas or as part of the filling for involtini (stuffed, rolled meat). 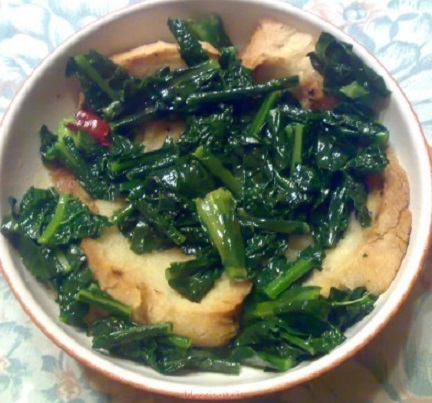 Chard can be prepared with other vegetables, such as endive, and baked in the oven with a béchamel sauce, for example. Escarole is a form of endive that is both versatile and tasty. 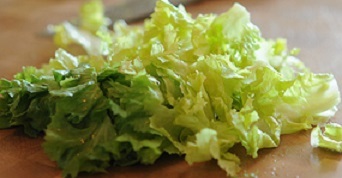 It is high in folic acid, fiber and vitamins A and K. Sometimes referred to as chicory and characterized by broad, dark outer leaves, this member of the chicory family does have a slightly bitter taste, but much less so than many other forms of endive. With a crinkled shape to the leaves, escarole is an example of greens that provide various degrees of flavor as the outer leaves are removed. While the outer leaves are a dark green, peeling back a layer will reveal a lighter shade of green. As more layers are peeled back, the leaves continue to lighten in shade. As the shade of the leaves lightens, the degree of bitter taste also lessens. The inner leaves are good in a salad and the darker, outer leaves can be sautéed. Try serving some escarole quickly wilted with lemon juice or stir chopped escarole into soup. A medium head of escarole usually yields about seven cups of torn leaves. Cavolo Verza: Savoy cabbage, also known as curly cabbage. A head cabbage with bright green, characteristically crinkly leaves. Very popular in northern Italy. Cavolo Cappuccio: Red or green smooth-leaved head cabbage. Common in Northern Italy, especially the Northeast. 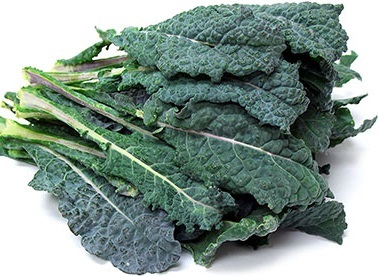 Cavolo Nero: Black leaf kale, a leafy cabbage with dark blackish-green leaves. It’s popular in central Italy, especially Tuscany. Cime di Rapa or Rapini: Broccoli raab, one of the more rustic flowering cabbages; both the tiny florets and the leaves are edible. Popular in central and to a greater degree in Southern Italy. Clean and rinse escarole twice; chop into large pieces. Add olive oil to the pan and heat. Add the chopped garlic and prosciutto and cook for 2 or 3 minutes. Do not burn the garlic. Add peppers and cook another minute or so. Add the drained escarole and broth. Gradually add the grated cheese, tossing gently until blended. Place in a casserole dish; sprinkle with the breadcrumbs and place under a broiler for 3-4 minutes until the breadcrumbs brown. Serve hot. Wash the Swiss chard leaves thoroughly. Remove the toughest bottom third of the stalk. Roughly chop the leaves and remaining stalks into inch-wide strips. Bring a large pot of salted water to a boil. Blanch the Swiss chard by boiling it just long enough to soften the leaves and stalks, about 4 minutes. Drain and set aside. Add the olive oil, garlic and the crushed red pepper to the pan. Sauté for about 1 minute. Add the diced pancetta, lower the heat and allow the pancetta to cook until lightly browned. Wash the cabbage, stripping the ribs from the leaves and slicing the leaves into strips. Next, heat 1/4 cup of olive oil in a soup pot; add the onion, carrot, celery and garlic and sauté until the onion is translucent and begins to color. Add the thyme and cabbage. Cook, stirring occasionally, for a few more minutes. Add the tomatoes and broth, mix well, check seasoning, and simmer the soup for an hour. In the meantime, slice and toast the bread and use it to line the soup bowls. Ladle the soup over the bread and serve it with freshly grated cheese, extra virgin olive oil and black or red pepper for those who want it. In a large skillet, heat oil over medium-high. Add onion and Italian seasoning; season with salt and pepper. Cook, stirring occasionally, until onion is golden brown, about 15 minutes (reduce heat if browning too quickly). Add garlic and sausage. Cook, breaking meat up with a wooden spoon, until browned, about 5 minutes. Add flour and cook, stirring constantly, 30 seconds. Add tomatoes, breaking them up with the wooden spoon. Cook sauce until slightly thickened, about 10 minutes. Season with salt and pepper. Meanwhile, in a large pot of boiling salted water, cook pasta 4 minutes less than the package instructions. Add broccoli rabe to the pot and cook 15 seconds. Drain pasta and broccoli rabe and return to the pot. Stir in sausage mixture. Transfer to a 3-quart baking dish or divide among four 16-ounce gratin dishes. Top with mozzarella and Parmesan. Bake until cheese has melted and liquid is bubbling, about 15 minutes. *A note to my readers who do not use US measurements – there is a recipe measurement/temperature converter tool in the side bar under Blogroll. Just click on the title and a new page will open with the converter tool. The diverse nature of Italy’s landscape accounts for its attractiveness which has made the country a popular place to visit. The country is a peninsula with a unique shape, extending into the waters of the Mediterranean, that is surrounded by seas on all three sides. On the south-western corner of the country is located the Tyrrhenian Sea, while the Adriatic Sea is on the north-eastern side. In the south-eastern area is the Ionian Sea and the Ligurian Sea is located in north-west Italy. 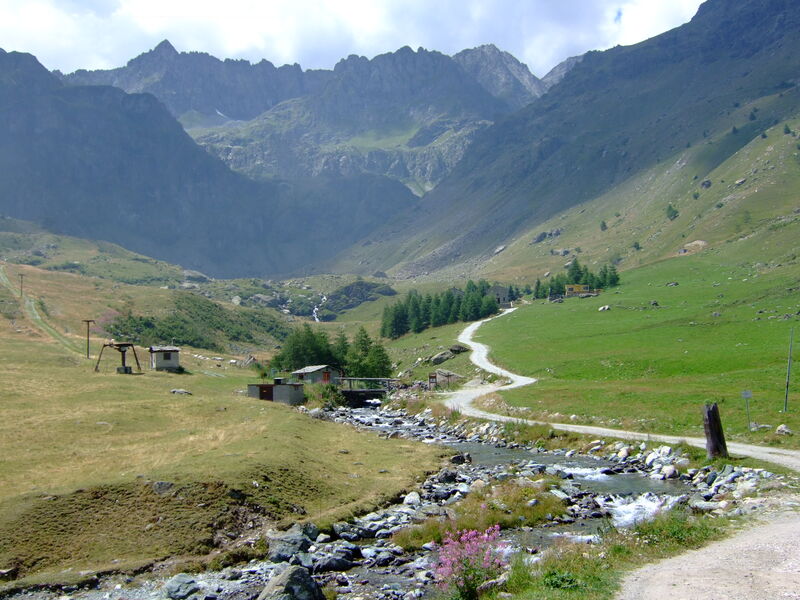 Italy has two major mountain ranges, the Alps and the Apennines. 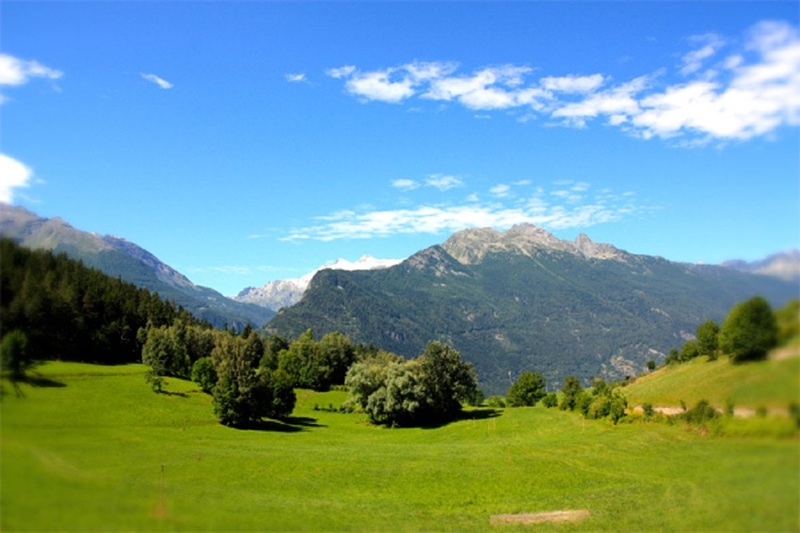 The natural position of both these mountain ranges is in the shape of an arc and this semicircular topography strengthens the northern boundaries of Italy against any possible foreign invasions. Mont Blanc, 4810 meters or 5,781 feet above sea levels, is the highest Italian mountain summit. 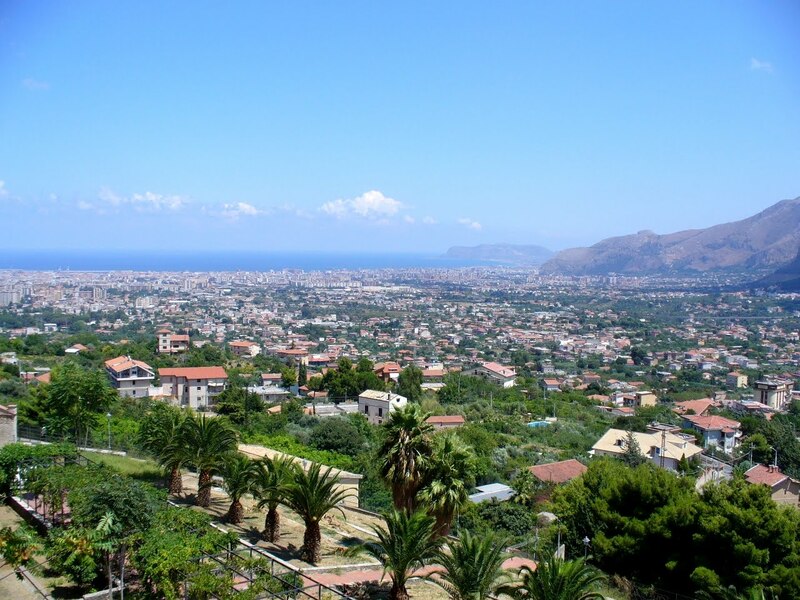 The country also has two volcanoes, among which Mount Vesuvius, close to Naples, is presently in a dormant state. The other volcanic peak in Sicily, Mount Etna is still very active. Next to the mountains and the seas, come the valleys and the plains . The Italian plains, known as the Padan Plain, contains one of the longest rivers in Italy – the Po (652 km) and its numerous tributaries, mostly flowing down from the Alps and Apennines to join it. Some of the tributaries of the Po River like Mincio, Dora Baltea, Trebbia and Secchia bring extensive alluvial deposits onto the plains, increasing its fertility and making it ideal for cultivation. Italy is also a land of lakes. The largest lake in Italy is Lake Garda that covers an area of 142 sq. 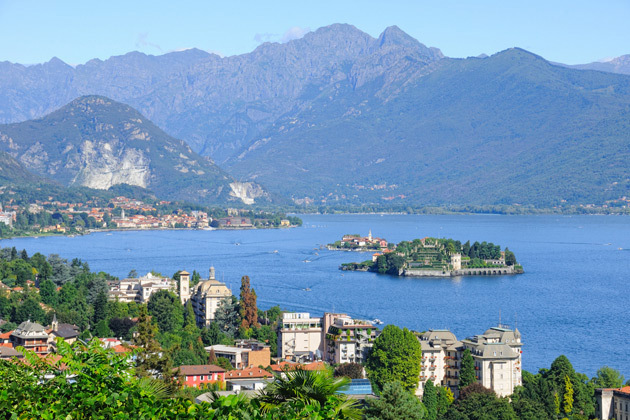 mi./370 km² and, another, is Lake Como, a major tourist attraction. All these fresh water lakes add to the scenic beauty of the land, making it more and more inviting to tourists. Northern and southern Italy are very different in climate. The south has very warm weather while in the north the weather is cold for a good portion of the year. 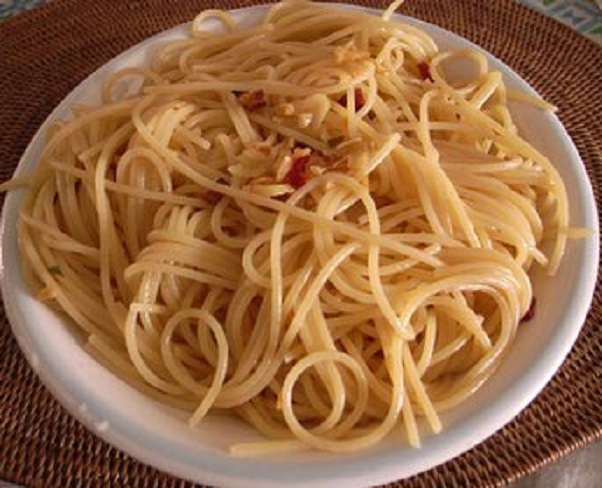 Dry pasta, like spaghetti and rigatoni, is found more in the southern areas because it is easier to dry pasta in warm weather. Since it is more difficult to dry pasta in the north, fresh pastas, like pappardelle and tagliatelle, are more popular. Other types of pasta popular in the north are stuffed pastas, such as ravioli. 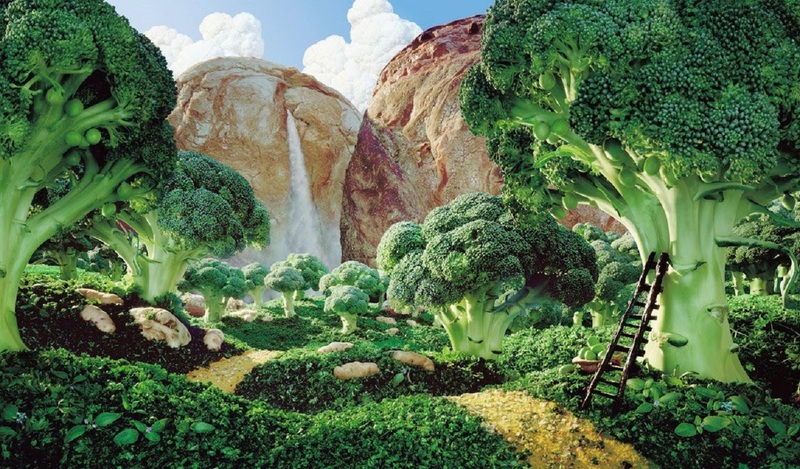 The climate also affects the types of food and plants that grow in Italy. 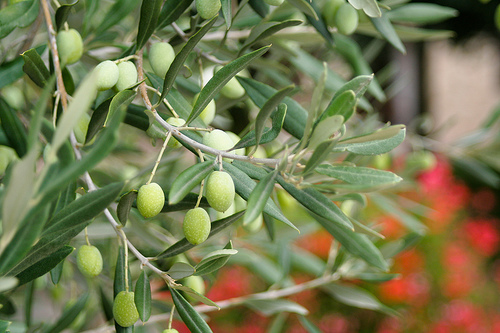 Some plants, like olive trees grow better in warm weather. Olive trees do not grow well in the northern areas where it is cold. In the south olive oil is used while in the north butter and lard are used in place of olive oil. Because of the gradually sloping hills in Parma, the consistent dry breeze make it an ideal location for curing and aging pork products, such as Prosciutto di Parma. The weather in southern Italy is conducive to growing vegetables and chilis that like hot weather conditions. Although Italians are known throughout the world for pizza and pasta, the national diet of Italy has traditionally differed greatly by region. Italy has 20 regions and I will be writing about them in the future. From the early Middle Ages, Italy consisted of separate republics, each with different culinary customs. These varying cooking practices, which were passed down from generation to generation, contributed to the diversity of Italian cuisine. 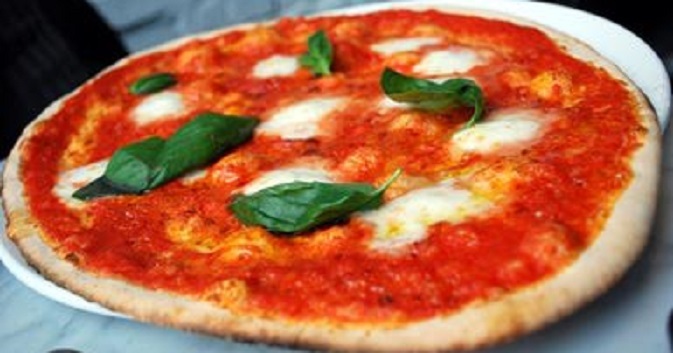 Italy’s neighboring countries, including France, Austria and Yugoslavia, also contributed to differences in the country’s cuisine. Pride in the culture of one’s region, or campanilismo, extends to the food of the locality and regional cooking styles are celebrated throughout the country. The mountainous regions of the north feature hearty, meaty fare. The Veneto’s coastal lowlands provide mussels and clams and the lakes and waterways inland provide a tremendous variety of fresh water fish, in addition to ducks and other wild birds. You’ll find a southern meal isn’t complete without a pasta course, while the north prefers gnocchi, risotto and polenta dishes. Cooking ranges from boiling and frying through slow braising and stewing and, in the latter cases, northern cooks use much less tomato, preferring to use wine or broth as the liquid and chopped herbs for flavor. The results can be elegant and the same holds true for roasts, especially those that contain winter vegetable stuffings. In Central Italy the summers are hotter and longer than those of the North and, consequently, tomato-based dishes are more common than they are further north; at the same time, the winters are chilly inland, making it possible to grow leafy vegetables that reach their best after it frosts, for example black leaf kale. Though there are braised meats and stews, in much of central Italy the centerpiece of a classic holiday meal will be a platter of mixed grilled or roasted meats, with poultry, pork or beef, especially in Tuscany, where the renowned Chianina cattle graze the fields. 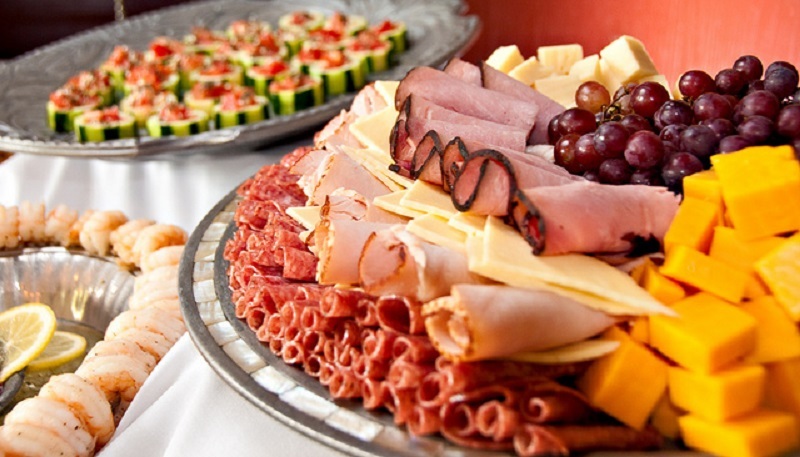 In Lazio, on the other hand, the platter will likely have lamb, which may also be present on Umbria and the Marche table. Central Italy also has a rich specialty farming tradition, with many crops that are difficult to find elsewhere, including farro, an ancient grain domesticated by the Romans and saffron, whose distinctive sharpness adds considerably to many dishes. The area, which is almost entirely hilly or mountainous, also boasts massive chestnut stands on the steeper slopes; chestnuts were in the past one of the staple foods of the poor and even now roasted chestnuts are a wonderful treat in winter, as are the dishes made with fresh chestnut flour. In the sun-drenched south, you will find more Greek and Arabic influences, with a cuisine featuring fragrant olive oils and many varieties of tomatoes both fresh and dried, spiked with hot peppers and seasoned with basil and oregano. Historically the South is known for shepherding and lamb and kid play a much more important role in the diet than they do in much of the rest of Italy. Fish in many coastal areas dominate. Sicilians add citrus, raisins, almonds and exotic spices that set their cuisine apart. The Spaniards’ influence, most notably saffron, is found throughout the south and also in Milan and Sardinia where they once ruled. A classic northern Italian stew. Flour the beef and brown the pieces in the butter, taking them out of the pot with a slotted spoon and setting them aside when brown. Slice the onions into rounds and brown them in the same pot, add a ladle of broth and simmer until the broth has evaporated. Add the meat, the spices, the bay leaf, salt and add a pinch of sugar. Then add the wine, bring it all to a boil, reduce the heat to a slow simmer and cook, covered, adding more broth as necessary to the meat submerged. 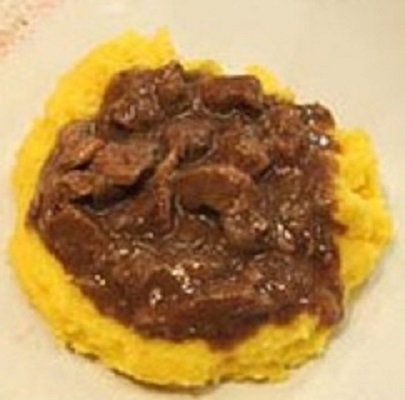 After about 2 hours or when the meat is tender, add a grinding of pepper and serve it over polenta. A central Italian traditional dish. Bring 6 quarts of salted water to a boil and add the spaghetti. Meanwhile, mince the garlic, crumble the red pepper and sauté them in the oil until the garlic begins to turn a light brown. Turn off the heat (the garlic will continue to brown; you don’t want it to over brown and become bitter). When the spaghetti is cooked to the al dente stage, drain, transfer to a serving bowl and toss with the sauce. Serve with grated Parmigiano or Pecorino Romano on the side; some people like it, whereas others, especially traditionalist Romans, shudder at the idea. Begin by dissolving the yeast in the water, in a large mixing bowl; let it stand for 5 minutes. Add the remaining ingredients and mix, either by hand or with a mixer set to low-speed, until the ingredients are blended. Hand-knead the dough or mix it with a dough hook setting the speed to low for about 10 minutes, or until the dough is smooth and elastic. Coat the insides of another bowl with olive oil and turn the dough in it to coat it in oil, then cover with plastic wrap and set it in a warm place to rise for an hour or until it doubles in volume. Preheat the oven to 475 F (250 C) — if you are using a baking stone it should heat for at least 45 minutes. Otherwise grease and dust two flat baking sheets with corn meal. Divide the dough in half, shape each half into a ball and let rest for 15 minutes. Then shape them into disks, stretching them out from the center on a floured surface. Do not roll them, because rolling toughens the dough. Ladle and spread a half cup of tomato sauce or chopped canned tomatoes over the dough, add the cheese and basil and bake for 15 – 20 minutes. If you’re using a baking stone and have a baker’s peel, lightly flour it, slide the pizza onto it and transfer it to the stone with a shake — the flour will keep the dough from sticking. If you don’t have a peel, use a flat cookie sheet instead, lightly flouring it, to transfer the pizza from the work surface to the stone. If you’re using metal baking pans you should bake the pizza towards the bottom of the oven.